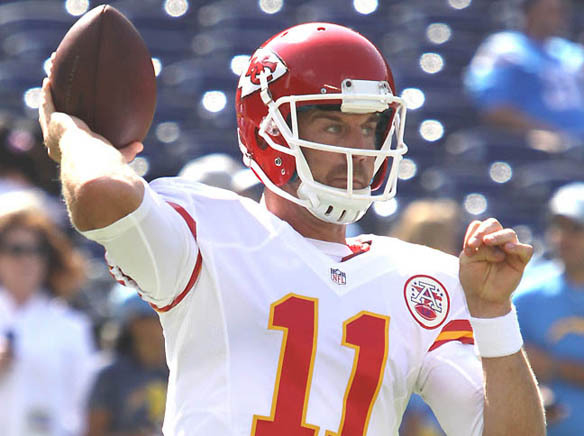 Two weeks after returning from a concussion, Helix High School alumnus Alex Smith helped guide the visiting Kansas City Chiefs to a last-second 20-17 victory against the 2016 Super Bowl finalist Carolina Panthers in a National Football League non-conference game on Sunday, Nov. 13. The win raised the Chiefs' record to 7-2 on the season and a tie atop the AFC West standings with the idle Oakland Raiders. The Chiefs trailed the Panthers 17-0 before storming back with 20 unanswered points, including kicker Cairo Santos’s game-winning 37-yard field goal as time expired. “It was a wild game, a crazy game, these are fun to be a part of, especially if you come out on this side of it,” Smith told the media after the game. Kansas City and Oakland have a one-game lead in the loss column over the defending Super Bowl champion Denver Broncos in the division standings after the Broncos defeated the host New Orleans Saints, 25-23, on a last-minute safety after. The Saints had tied the score 23-all on a touchdown pass from former Chargers quarterback Drew Brees but the extra-point conversion attempt was blocked by Denver’s Justin Simmons and returned 84 yards by teammate Will Parks for the game-winning two-point safety. Smith passed for 178 yards with one interception in the Chiefs' latest victory, their fifth consecutive and 17th in their last 19 games. Smith had led Kansas City to a 5-2 start before suffering a concussion in an Oct. 30 game against the Indianapolis Colts (a 30-14 Chiefs' win). Reserve quarterback Nick Foles led Kansas City to a 19-14 win over the visiting Jacksonville Jaguars in the game following Smith's injury. Smith, playing in his 12th NFL season, returned to the starting lineup for Sunday's game. He admitted the outcome of the game could have turned earlier in the Chiefs’ favor than it did. On the season, Smith has passed for 1,616 yards and eight touchdowns with three interceptions in eight games. He has a 90.3 quarterback rating. He has thrown for 26,160 yards, 150 touchdowns and 86 interceptions in 134 career games with both Kansas City and San Francisco. The Chiefs won Sunday’s game without scoring an offensive touchdown. Santos kicked four field goal of the day and Eric Berry returned an intercepted pass 42 yards for a defensive score. Smith threw a successful two-point conversion to Travis Kelce following the pick six by Berry. Kansas City managed just 256 total offensive yards. Spencer Ware gained 61 rushing yards to complement Smith’s aerial yardage. With the game tied 17-17 following Santos’ third field goal in the game with 4:25 left in the fourth quarter, KC defender Marcus Peters ripped the ball from the grasp of Panthers receiver Kelvin Benjamin after a completion by Carolina quarterback Cam Newton. Peters then returned the ball to the Panthers’ 24-yard line but kicked the ball into the stands in celebration that handed the visitors a five-yard delay of game penalty. However, the infraction kept the visitors within field goal range. The Chiefs moved the ball to the 20-yard line on the next play. Smith then moved the ball to the right hash mark for Santos, whose ensuing kick won the game. “With their game plan, they (the Panthers) eat up the clock, play defense,” Smith said. “They feed on turnovers, feed on mistakes. You’re only going to get limited opportunities. You’ve got to be able to connect on them. “After (Berry’s) interception, with that much time left in the game, it looked like the game would come down to the wire. Having played in an overtime game this year (a 33-27 come-back win over the visiting Chargers in the teams’ season opener), in close, tight games, it only helps you. Newton passed for 261 yards with a passing touchdown and rushed for 54 yards and one touchdown in the loss for Carolina (3-6). The Chiefs will next host the Tampa Bay Buccaneers on Nov. 20. The Chargers will host the Chiefs in the teams' final regular season game on Jan. 1 that will serve as Smith's homecoming. Kansas City rallied from a 21-3 halftime deficit against the Chargers in the teams’ season opener. Smith scored the game-winning touchdown in OT. Kansas City is one of seven teams in the AFC with winning records. The four division champions, plus two wild card teams, will qualify for the upcoming playoffs. The Chiefs advanced to the second round of the NFL playoffs last season. “This group has some character," Kansas City coach Andy Reid told the media after Sunday’s game. “It doesn't mean you win every game but when you play like this you give yourself an opportunity to win." San Diego County high school football alumni are strewn across the face of the nation in the major college and pro ranks. 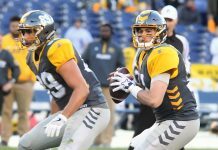 Sunday's NFL game at Qualcomm Stadium spotlighted a pair of San Diego County prep products on the roster for the visiting Miami Dolphins: wide receiver Kenny Stills (La Costa Canyon) and tight end Dominique Jones (Horizon Christian Academy). Stills, son of former NFL standout Ken Stills (1985-90), left the University of Oklahoma a year early to play in the NFL after racking up 2,594 receiving yards and 24 touchdowns for the Sooners in three seasons. This is his fourth season in the NFL and second with Miami after being acquired in a trade with New Orleans following the 2014 season. He has accumulated 2,387 receiving yards and 15 touchdowns in his NFL career. He has 19 catches for 375 yards and four touchdowns this season. In two years with the Saints, Stills collected nearly 1,600 yards and eight touchdowns. Stills set a San Diego Section record with 3,041 receiving yards. He set freshman records at Oklahoma for receptions (61) and receiving yards (786) with five touchdowns. Jones, who attended Liberty Charter School in El Cajon before finishing his prep career at Horizon Christian, an alumnus of Shepherd University, is in his fourth NFL season. He has prior experience with Indianapolis, Kansas City, Denver, Buffalo, Baltimore, New York Giants and Minnesota. Jones was Miami’s leading receiver with three catches for 42 yards in a 27-23 win over the New York Jets on Nov. 6. Stills caught a 39-yard touchdown pass from quarterback Ryan Tannehill with 2:50 to play in the first half to narrow the Chargers' lead to 10-7. Stills finished his homecoming game with two catches for 47 yards and one touchdown. Jones did not catch a pass in the game. The loss snapped a modest one-game winning streak for the Chargers and dropped them further back in the AFC West championship race at 4-6; the Dolphins improved to 5-4 to remain alive in the AFC wild card race. The game's final minutes produced an exciting finish with a pair of touchdowns and two interceptions that decided the outcome of the non-divisional contest. Tyrell Williams caught a 51-yard touchdown pass from Philip Rivers with 4:04 remaining in the game to lift the Chargers from a 21-17 deficit to a 24-21 lead. Rivers threw three touchdowns in the game to move past John Elway into eighth place on the career list with 301 touchdowns. But the Dolphins promptly responded with a 56-yard pass from Tannehill to DeVante Parker to place the ball first-and-goal at the 10-yard line. Facing fourth-and-goal, Miami elected to attempt a 27-yard field goal with 3:01 to play in regulation, which was good by kicker Andrew Franks, to tie the game 24-24. However, the Chargers quickly advanced into Miami territory inside the two-minute warning. But Kiko Alonso stepped in front of a Rivers' pass and returned it 60 yards for a game-clinching touchdown. The successful PAT conversion gave the Dolphins a seven-point lead, 31-24, with 1:01 to play in the fourth quarter. Tony Lippett then picked off Rivers for the second time with 37 seconds left to seal Miami's win. Rivers finished the game with 326 passing yards but threw four interceptions. Tyrell Williams, Antonio Gates and Hunter Henry each had touchdown catches for the Chargers. The Salute to Service-themed game attracted a crowd of 55,107 to Qualcomm Stadium. The Dallas Cowboys have the NFL's best record at 8-1.